Tarell Alvin McCraney's refreshing new play Choir Boy looks at a different social set from his groundbreaking The Brothers Size but again shows his playwriting genius. 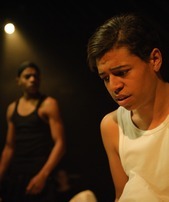 The play is set in a boarding prep school in the American South where the families of young men of colour pay fees to provide their sons with a top class and religious education to smooth their path to excellent universities. The central character of the play scholar Pharus Jonathan Young (Dominic Smith) leads the school's famous choir but is a gay young man who has to face the prejudice of some of his well heeled classmates. Pharus is looking to overcome a double prejudice. Director Dominic Cooper gives the school authenticity and the playwright has interspersed rousing school songs and beautifully evocative hymns between scenes and it is during Pharus' singing the school song at the seniors' graduation that he suddenly stops singing, breaking with a 49 year old tradition. Pharus stopped singing because he was subject to whispered homophobic insults from another of the boys but the prep school code of conduct means that when questioned by Head Master Marrow (Gary McDonald), Pharus cannot name the perpetrator. McCraney's play takes us into the lives of these young men with differing backgrounds through the scholarship system and differing ambitions. Pharus shares a room with athlete Anthony Justin 'AJ' James (a brilliant debut from Khali Best) who is the role model for tolerance and friendship. The headmaster's nephew Bobby Marrow (Eric Kofi Abrefa) comes from a privileged family and the whole school is aware of his relationship to the head. Junior 'JR' Davis (Kwayedza Kureya) is Bobby's sidekick and David Heard (Aron Julius) is another scholarship boy who has been grappling with his own sexuality and has found answers in religion. A retired professor at the Charles R Drew Prep School, Mr Pendleton (David Burke) is a veteran of the civil rights demonstrations of the 1960s. Choir Boy challenges us by making Pharus a double edged sword. He is rather sneering and priggish, flicks his wrists and minces affectedly but we also sympathise with a vulnerable young man in a hostile world. Because he is not immediately likeable the play has a balance and makes its audience take a journey. The writing has depth and good characterisation which could make this a great play to study in schools as several kinds of prejudice are examined. Every character has a back story worthy of analysis. Dominic Cooke has elicited remarkable performances from his young cast both in totally believable acting and with some lovely singing. Interesting although we know they refer back to the 1960s the play is almost timeless, a reflection of the continuation of the school tradition as Charles R Drew celebrates its 50th anniversary. There are no references to President Obama and the change he has made to American tradition. Choir Boy commissioned by the Manhattan Theatre Club will be previewing from June 2013 at The Studio at Stage II on its American premiere and is already sold out in London.